September 19, 2010 - The National Business Aviation Association (NBAA) announced that, as part of the 63rd Annual Meeting & Convention, several business aviation legends will be presented with Wright Brothers Master Pilot Certificates from the Federal Aviation Administration (FAA). 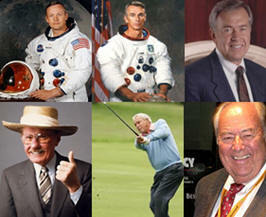 Being recognized are Neil Armstrong, Gene Cernan, Bob Hoover, Clay Lacy, Russ Meyer and Arnold Palmer. All six men will be present at the event to receive their certificates in person from FAA Administrator Randy Babbitt. The presentation of the Master Pilot Certificates will be part of a first-ever general session on the Convention?s second day. Both the new, second-day session and the Convention's traditional first-day Opening General Session will take place on the exhibit floor this year at the World Congress Center in Atlanta, GA.
"Our congratulations to these individuals on this well-deserved recognition," said NBAA President and CEO Ed Bolen. "Each of these distinguished figures has made indelible contributions to business aviation, and we are delighted that they will stand together and be recognized for reaching a milestone in flight as part of our Convention." According to the FAA's web site, "The Wright Brothers Master Pilot Award recognizes pilots who have demonstrated professionalism, skill and aviation expertise by maintaining safe operations for 50 or more years." Bob Hoover is a legendary Air Force test pilot and air show performer, who many consider the ultimate "pilot's pilot." Among his many contributions to aviation safety, he has promoted the "Hoover Nozzle," to ensure that jet fuel is not inadvertently pumped into piston airplanes. Clay Lacy, a pilot and the president of charter service Clay Lacy Aviation, is also a director and videographer, having conducted more than 2,500 air-to-air photography flights, including sequences in movies like "Top Gun" and "The Right Stuff," which have inspired thousands of people to fly. Russ Meyer, Chairman Emeritus of the Cessna Aircraft Company, led the company from 1975 until 2003. Under his leadership, Cessna received two Collier Trophies, in part for the safety record of Cessna's airplanes. In addition, Meyer has won the Wright Brothers Memorial Trophy and NBAA's Meritorious Service to Aviation Award, the Association's highest honor. Arnold Palmer, an American icon and esteemed businessman, has spent a lifetime promoting business aviation. He currently serves as a spokesman for the No Plane No Gain advocacy campaign, and has addressed NBAA's Annual Meeting & Convention on several occasions, each time highlighting the benefits the industry brings to the nation's economy and transportation system. After receiving his Master Pilot Certificate at Wednesday's event, Palmer will be honored with NBAA's 2010 Meritorious Service to Aviation Award. That recognition will be accompanied by a video greeting from fellow No Plane No Gain spokesman Warren Buffett, who will welcome Convention attendees and congratulate Palmer on his recognition from NBAA.